Between the rocky Dogon Plateau in central Mali and the border with Burkina Faso stretches the Seno Plain and its densely settled farmland. The Seno Plain is located in the Sahel, where limited and highly variable rainfall (500–600 mm per year) makes farming a challenge. Indeed, land degradation, deforestation, and out-migration from the Seno Plain were common during the long series of devastating droughts that affected the entire Sahel from the late 1960s to the 1980s. Despite the earlier out-migration, population has steadily increased in recent decades, increasing human pressure on the land. The views from space tell a story of change— including a positive development that is often missed. 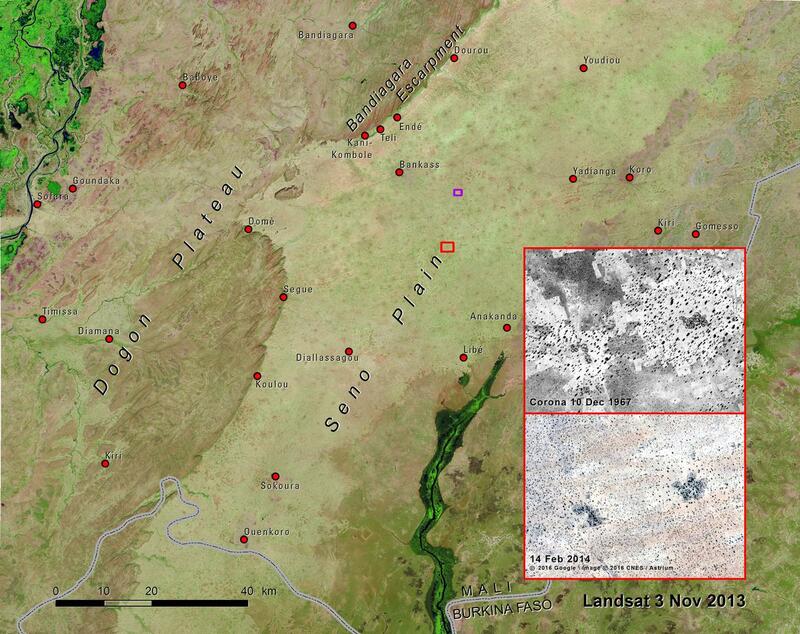 In the 1972 Landsat image, we see a patchwork of cultivated land (light areas) and shrub and tree savanna (darker areas). Farmers still practiced crop rotation that included leaving land in bush fallow. As population increased, more and more land was put into cultivation, virtually eliminating the fallow area. The 2013 image shows the continuous cropland, with hundreds of villages (dark spots) scattered throughout the sandy plain. The villages stand out in part because of their built-up surfaces and shade trees, but also because of the fertilizing effect of household and animal waste in the fields adjacent to each village. — characterized the extensive bush fallow between villages. 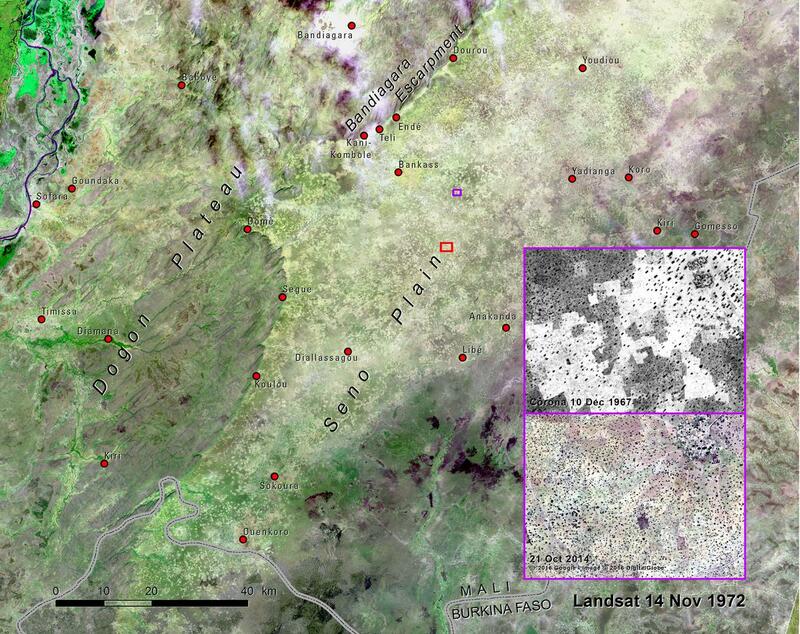 The two detailed comparison images show the transformation that is typical around villages in the Seno Plain over the past 47 years. In the 1967 views, bright fields stand out from the surrounding bush fallow. The parkland of trees tends to be limited to the fields immediately adjacent to each village. In the 2014 image, the villages have visibly increased in size, and the surrounding land is completely saturated with cropland. Many of the large, older trees seen in 1967 did not survive the drought years and the increased pressure for firewood and fodder; however, in a positive development, a parkland of young trees has replaced them — extending well beyond the inner fields to the entire landscape around each village. Many local farmers confirm the decline in tree cover in the 1970s and 1980s, and the widespread re-greening of the Seno Plain since then. While improving rainfall conditions in the past two decades might have helped trees to regenerate on these farmlands, most of the changes can be attributed to human activity (Spiekermann and others, 2015). Since the mid-1990s, international and local non-governmental organizations have jointly promoted farmer-managed natural regeneration, echoing the success stories from the Maradi and Zinder regions of Niger. The new forestry law of 1995 has promoted a more decentralized forest management approach, which has facilitated improved environmental management by local institutions.